Welcome to 30492- LONDON CELTIC PUNKS 100th post. The last couple of days I’ve been wandering around shellshocked that 55% of the Scottish people still consider themselves as serfs and are servile to a foreign government. We must continue the fight and keep agitating for a Scots republic free from outside influence. To that end we give you a post on the original Scottish folk-punk band The Nyah Fearties and remind ourselves what we were fighting for in the first place! Nyah Fearties are the hidden gem in Scotland’s rich musical strata! In the 80’s and 90’s they ploughed a lone path through the mire of bland music and created a lightnin’ fast, metal bashing, feedback drenched noise… all the more surprising because they were a duo and they played ACOUSTIC instruments! Nyah Fearties were a Scottish band hailing from Lugton. Davey Fearties was kind enough to answer a few questions about the band and to give us permission to post a few of their songs. 1) How did you all come up with the band name Nyah Fearties? I think it’s great. Were you all fans of dub and reggae at the time? Yep, the original band played a few reggae covers. Keith Hudson’s Smoking was one. 2) What bands were you listening to when you formed Nyah Fearties? We listened to all sorts from Nick Cave, Pogues, Violent Femmes, Alex Harvey, Suicide, Einsturzende Neubueten… and lots of Reggae. Reggae music was so alive in the 80’s. It’s so overlooked when people mention 80s music. 3) What bands did you most enjoy playing shows with? Have any good stories about playing live? The Pogues has got to be my favourite. We were a pair of hobo street musicians when they took us on tour with them.Andrew Rankin, the drummer, used to play the last 2 songs of our set with us, and Spider would play whistle sometimes. But there was one night when we got to the last song, and I looked across the stage and there was Shane beating on a plastic chair with a stick and doing some crazy rockin roll dance, Jem on Banjo, Phil on Guitar, Spider singing, Daryl on plastic chair, Andrew on drums just giein it laldy (it’s a Scots saying that means letting go and giving it all you’ve got) to the song Drunken Uncle that we did as our last song – cartoonesque. 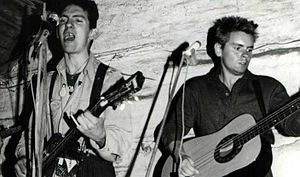 The other band which, like the Pogues, had that live magic about them was Mano Negra, the most energetic live band on the planet at the time. 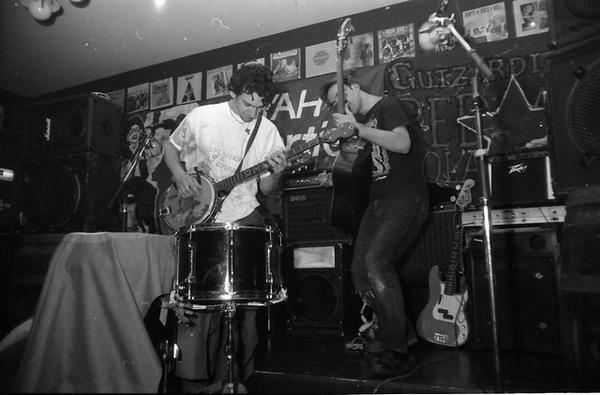 A Mano Negra gig was like an early Clash gig for atmosphere. 4) Your music is clearly very political. At the time were you and Stephen involved in politics in any other way? No, I was never a good liar. But Stephen would have made a great prime minister. He couldn’t have messed it up much more than the previous few in this country. 5) I’m not entirely familiar with Scottish politics in the 80’s and early 90’s. I was wondering if you could explain the meaning of a few songs: “Radiation Reign,” “Rantin’ Sonsie an’ Free,” and any other songs you particularly like. This world’s gone crazy. ‘Radiation Reign’ was about Chernobyl and the effect that disaster had on places as far away from Russia as Scotland and Wales where for many years mutated livestock were being found on the high ground due to the spread of Radiation..and that feeling when it happened of “what have they done” and the despair of it..A bit like the Fukushima disaster in Japan. ‘Rantin Sonsie An Free’ was about how in Scotland the main language is English, even though you might doubt that when you hear what we do to it. The common tongue people speak with is a colourful mix of Scots, and when as a child you would speak Scots, you would be told it was bad English and there is always a negative spin to it. Even on TV and Radio, characters who speak that dialect will be portrayed as alcoholics, or mainly very negative role models. There’s a Scottish comedy show called ‘Burnistoun’, and a sketch called ‘Real Guy’. YouTube it, and you’ll see what I mean. 6) How did the song writing process normally work for Nyah Fearties? It varied on what Instruments we had at the time, embelish stories, or whatever inspired us at the time. There was no technique. Most were spontaneous. Stephen had a great gift for coming out with these crazy comical rants which seemed to spring out of nowhere. 7) Your instrumentation is pretty unique. What did you two play? Stephen played Ganjo, which was a 5 string guitar tuned like a banjo. He played Banjo, and found percussion. I played acoustic electric bass and a bit of guitar. Most gigs we went for a walk and found percussion on the street. Could be a shopping trolley, oil drum, tin bath. It was great to see the look on the soundman’s face when he had to mike up an electric fire or a sheet of corrugated iron. 8) Nyah Fearties was together for around a decade. How did the band change over time? We found other musicians, added fiddle and accordian, became more musical and less industrial. We went from an acoustic bass and a Ganjo to a full 5-piece band. But with a band it was more difficult to get to and play gigs. 9) What bands did you and Stephen play in afterwards? Stephen did his Mr Luggs songs. I did Dub Skelper which was Scottish folk mixed with reggae and ska. Then Junkman’s Choir which Stephen played drums in for a few years. Junkman’s Choir is now a 2-piece and still playing mainly around Scotland. 10) What musical projects are you all currently working on? I was travelling in India and recorded a whole load of Indian influenced music in a toilet in New Delhi, under the name Lugtone. You can find it at lugtone.bandcamp.com, or check out Lugtone on YouTube. Basically its an audio visual postcard. thanks to WFMU’S Beware Of The Blog where this interview was first published. there’s a great article on The Nyah Fearties here in Plain Or Pan blog zine. there’s an hour long tribute to The Nyah Fearties here on No Men FM. Check their facebook group here.